Before we get into the Beoplay H6 vs. Sennheiser Momentum review, grab a snack, sit back and relax because.. Note: Today I will be reviewing the new model, as it’s a significant upgrade from the old. New Model: Amazon | Check eBay! Impedance: 30 Ohm. What is Headphone Impedance? The driver cover cloth is green on the old model, and black on the new. The barrels of the headphone cables no longer have metal finishes, but now fit through slightly thinner openings in phone cases. The bass has improved. On the original H6, it was a little bass light/lean. On the new model, they added just enough as not to overpower the overall sound. The mid-range has improved. On the original H6, it was a little bumpy, and unsure of itself. The new model improves on this by making the mid-range smoother. There’s more treble detail in the new model, but it doesn’t sound harsh or sibilant. What does Sibilant mean? An amp isn’t necessary with the new model as it’s more efficient. There is less clamp force on the Generation 2’s. This could be a good or bad thing depending on the size of your melon. I would say if your head is smaller, you may like 1st generation H6’s better. The Beoplay H6 has a smooth, balanced overall sound, and remains one of the most comfortable, portable, and lightest headphones on the closed back market. These babies are extremely elegant, and a plethora of folks have commented on their brilliant soundstage, which is rare for a closed back headphone. The price is a tad questionable considering that you don’t get much in the box, but most people said it’s still worth it despite that. Phenomenal build quality, with a pristine fit and finish. Extremely portable and lightweight. They also fold up nicely. Great soundstage and imaging. What is Soundstage? Non fatiguing. You will be able to listen to these for hours without discomfort. Good sparkle in the treble range. Extremely detailed in the mid-range as well. An overall balanced sound and stylish design. *() denotes how many had the issue. They sound good out of a mobile device, but do benefit from an amp. People are saying that an upgraded cable seems to really help the overall sound. Fiio E17k Alpen 2 DAC/amplifier. With this amp, the bass becomes more punchy, and the treble extension improves. The amp also has a built in EQ. Really good pairing. I would also keep in mind that these are not bass heads headphones. Do not buy them if you only listen to Rap or Hip-Hop. Overall though, these are great for pretty much all genres of music, but really excel with softer stuff like Classical and Acoustic. The sound here could be described as smooth and inoffensive. They only come with a short cable. They come with a felt carrying bag, but some would have preferred a sturdier case given the price. One person reported a strong odor of paint upon first unboxing, causing him to become dizzy for a spell. If you have really large ears or wear earrings, the ear cups might be a tad small for your liking. Many people were saying that the stock cable with remote isn’t very good, and that you should most definitely get a replacement. It will liven up the sound considerably. Also, the inline remote was meant for iOS and it only partially works with Android. If you have eyeglasses, they may become uncomfortable after a spell. They open up with increased burn in time. The headband could be softer and better padded, but this is really a nitpick. Sound quality is superb. Amazing soundstage for a closed back can. A bit pricey, especially because you aren’t getting much else in the box. A cable replacement is necessary to get optimal sound. Before we get into it, let me just point out that there are a few different versions of the Momentum. The one you should be most focused on however is the Momentum 2.0 Wired (Over Ear), which is in my opinion the best out of the bunch, and the one most worthy of your dollar. Both are good with sound isolation. Both have a detachable cable. Both have an inline mic. Both have a straight plug. Both are Circumaural (Over ear). Both come with a travel bag. Both have a 3.5mm connector. Bass. There is more bass on the Momentum than on the H6. The frequency response also echoes this: 20-22kHz for the H6, and 16-22kHz for the Momentum. Impedance. 18 Ohms for the Momentum 2.0 vs. 30 for the H6. Material. The H6 is made of aluminum, fabric, leather and polymer, while the Momentum is comprised of Alcantara, leather, plastic, and steel. Weight. The H6 is 230g compared to 190 for the Momentum. Additional Features. The H6 has a detachable cable, microphone, and volume remote. The Momentum has a detachable cable, inline playback controls, microphone and volume remote. Overall sound. I would say if you’re looking for a more balanced sound, the H6’s are definitely more neutral than the Momentum’s. 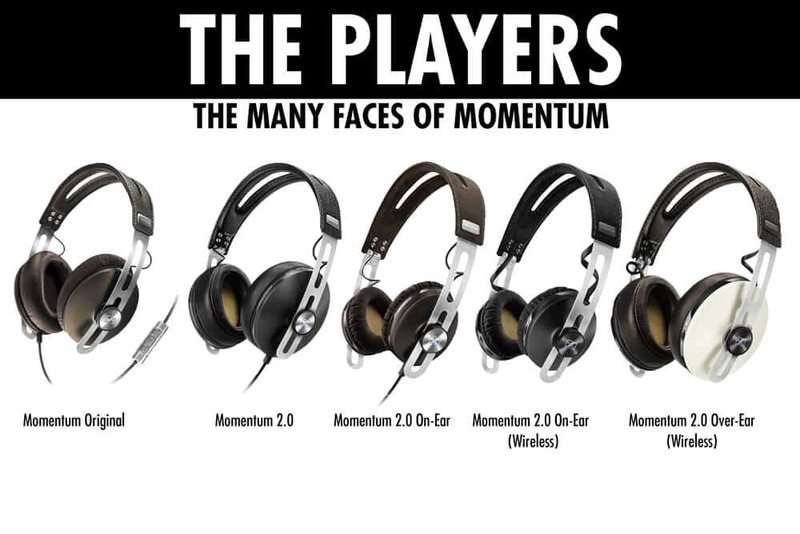 The Momentum is really a headphone meant for fun listening. L shaped plug. The Momentum has an L-shaped plug while the H6 does not. I would say which of these you go with depends on what kind of sound you’re looking for. The Momentum is pretty much the standard for closed back, fun, portable sound, although they are a bit pricey but well worth it. The H6 is a phenomenally balanced headphone that you can kick back and relax with, as it does well with most genres, and has a deep bass response when called for. SEE THE SENNHEISER MOMENTUM 2.0 FOR YOURSELF ON AMAZON!! LEARN MORE ABOUT THE MOMENTUM’S IN MY SENNHEISER HD598 VS. MOMENTUM COMPARISON!! CLICK HERE TO READ THE BEOPLAY H6’s REVIEWS!! Well that’s about it for today my friend! I hope you’ve enjoyed this article on the Beoplay H6 vs. Sennheiser Momentum. Grado GS1000i vs. GS1000e | SIMILAR? ATH M50 vs. DT 770 | WHAT’S THE BUSINESS?